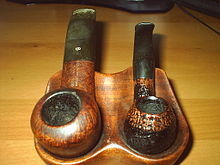 Two well-used tobacco pipes with different sized bowls. A narrow bowl permits low-temperature operation and more nutrient vapor reception. The bowls of ceremonial pipes used by some indigenous American nations are often carved from red pipestone or catlinite, a fine-grained easily worked stone of a rich red color of the Coteau des Prairies, west of the Big Stone Lake in South Dakota. The pipestone quarries have traditionally been neutral ground among warring tribes, as people from multiple nations journeyed to the quarry to obtain the sacred pipestone. Sacred ceremonial pipes are not used for smoking intoxicants, but rather to offer prayers in a spiritual or religious ceremony. ^ Curtis, Thomas, ed. (1839). London Encyclopaedia or, Universal Dictionary of Science, Art, Literature, and Practical Mechanics, Comprising a Popular View of the Present State of Knowledge, Vol. IX: F to GARTER. Thomas Tegg. p. 676. ^ "Hunting for a Little Ladle". history.org. Retrieved 1 February 2015. 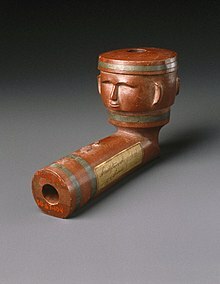 ^ "Catlinite, Calumet Pipes and Pipestone National Monument". Maps, Material, Culture, and Memory: On the Trail of the Ioway. University of Iowa. Retrieved 19 May 2016. ^ "Pipestone National Monument". National Park Service. Retrieved 19 May 2012. This page was last edited on 7 April 2019, at 21:22 (UTC).